SivaTeja Pati says he will continue to refine the design moving forward. 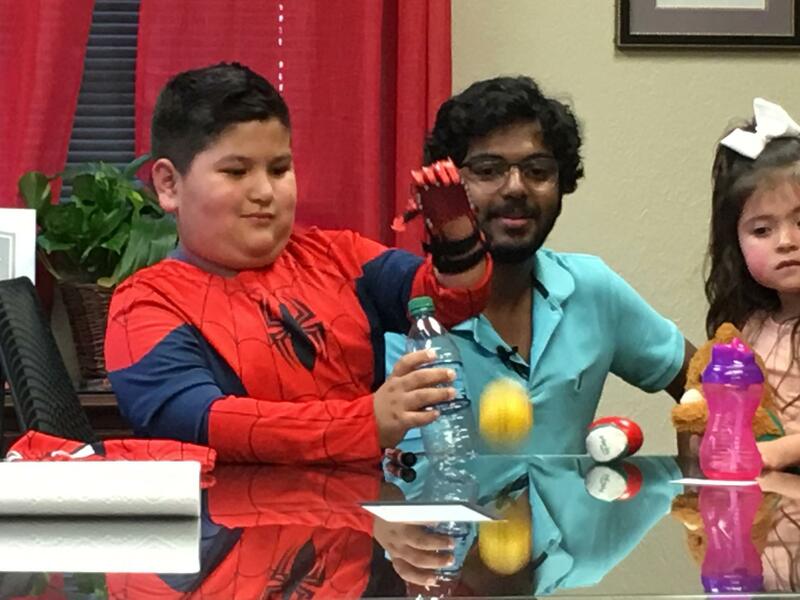 Eight-year-old Toby Carrizales loves Spider-Man. 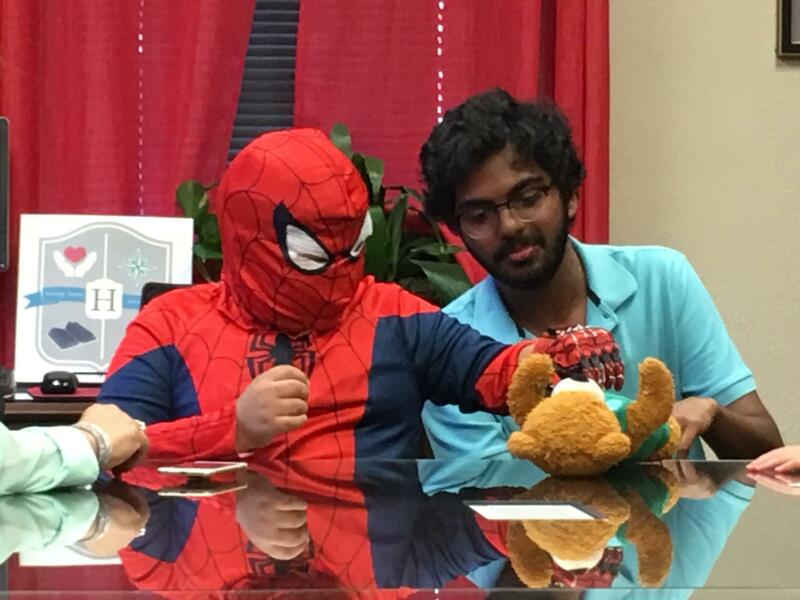 Spider-Man's true identity, Peter Parker, is more than he seems. He is a man who lives to save others, a man who has great power – and therefore, great responsibility – in his hands. It's understandable why Toby, who was born without a left hand, idolizes him. 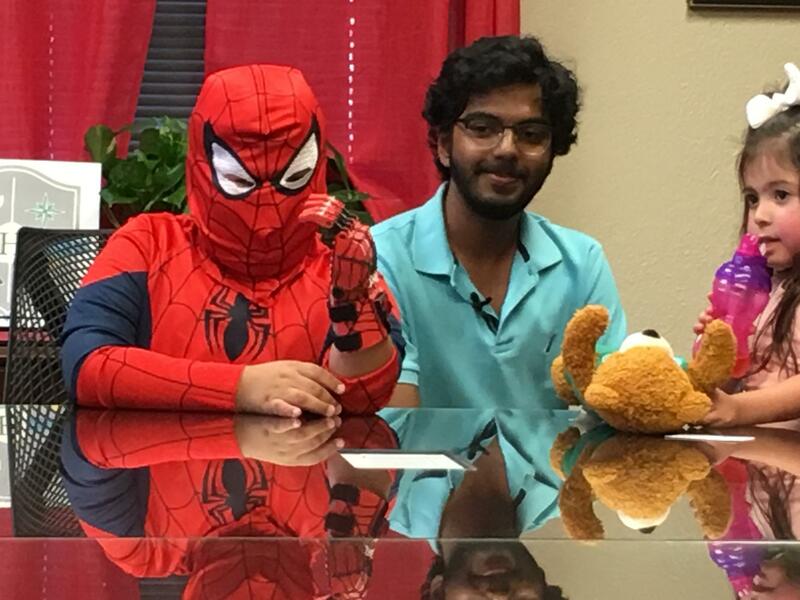 Late Friday afternoon, Toby – in a full-body Spider-Man costume, mask over his head and eyes visible through its slits – became a little more like Spider-Man: part human, part superhuman. 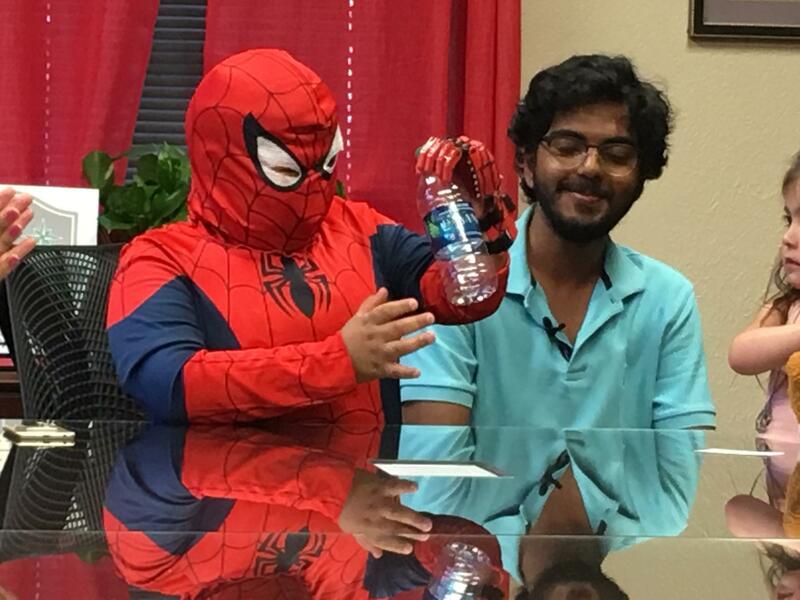 SivaTeja Pati, a biology major at Texas Tech University, presented Toby with a custom-made, Spider-Man-patterned prosthetic hand he designed and 3D printed for the boy, using the Makerspace in the University Library. Pati, who goes by “Teja,” has been on the health care track for a long time. He was involved in Health Occupation Students of America at Seven Lakes High School in his hometown of Katy, Texas, and shadowed physicians at four different medical centers throughout his junior and senior years. The same month he graduated, he joined the community volunteer fire department as an EMT. After starting at Texas Tech in fall 2016, Pati joined the American Medical Student Association. So it's no surprise that he intends to go to medical school once he graduates – and he's even speeding up that process. Though he's just finishing his second year at Texas Tech, 20-year-old Pati is already a senior by hours. As an aspiring physician sometimes does, Pati was scrolling the National Institutes of Health (NIH) 3D Print Exchange database one day when he stumbled across a 3D printable file comparing a healthy brain to the brain of a person with Alzheimer's disease. These brains were some of the earliest items Pati 3D printed, using the Makerspace in the University Library. The red brain is that of a healthy person while the white brain is that of someone with Alzheimer's disease. The brains were some of his earliest 3D printing endeavors. Also on the NIH database, he found designs for a prosthetic hand from an open source group called e-NABLE, which shares designs for affordable prosthetics. Pati downloaded some of these designs, brought them into the Makerspace and, with the help of Makerspace specialist Sean Scully, 3D printed a hand to show in class for a persuasive speech on the need for an e-NABLE group in Lubbock. This was the first prosthetic hand Pati 3D printed. It uses the same grasp-type mechanism as the hand he made for Toby. The speech inspired Pati to take action, so he began working to start a 3D printing club through the Makerspace, a branch of which would focus on prosthetics. Scully told her they could, and if the library could pair her up with a student or a member of the Texas Tech community, it probably could be done for free. Although the project would involve far more engineering than the biology major was accustomed to, Pati agreed to take on the project because of its interdisciplinary nature and the role that sort of work has in the field he aspires to enter. While Pati was working on the project, however, the Makerspace had to begin charging a nominal fee to cover materials for personal projects, so Scully urged Pati to turn it into a research project, which would be free. Pati, already a student in the Honors College, connected with John Carrell, an assistant professor of engineering in the college who became Pati's Undergraduate Research Scholars (URS) adviser. With Carrell's expertise in engineering and Scully's expertise in computer-aided design and drafting, Pati was able to customize the open source design to fit Carrizales' grandson, Toby. “We used our 3D-scanning capabilities here in the Makerspace to scan Toby's arm, then we were able to 3D print it so he wouldn't have to come in constantly,” Scully said. “Some of the parts need to be form-fitted, so we have to heat them up and mold them. Because we were able to establish it as free, printing a large arm didn't seem to be too expensive. This is a 3D printed copy of Toby's arm that Pati used as a model when creating the boy's prosthetic hand. The actual fabrication of Toby's hand took two to three months, but Pati's process has been much longer, Carrell said. As Toby practiced grabbing dry erase markers, a roll of paper towels and a water bottle, Pati explained Toby's new hand is only the first step in a much longer research process. The pinch grip, using the index and middle fingers and the thumb, is still in the design phase, but Pati is confident. “He'll eventually be able to pick up small, flat things,” Pati said. Carrell and Pati want to maintain some sort of mechanical method to switch between the grasp and pinch grips. Not only is that a simpler method than an electronics-based solution, but it's also a more reasonable option for Toby's family. It's a consideration many parents can identify with. When Toby was 4 months old, he received his first prosthetic, Carrizales said. In tears, she said the way he studied his new hand reminded her quite forcefully of his initial fascination with the first. “It was more like a doll hand,” explained Toby's mother, Desiree Lopez. “It didn't serve any purpose, it was more of a cosmetic thing. He didn't like it, so we maybe put it on him twice. 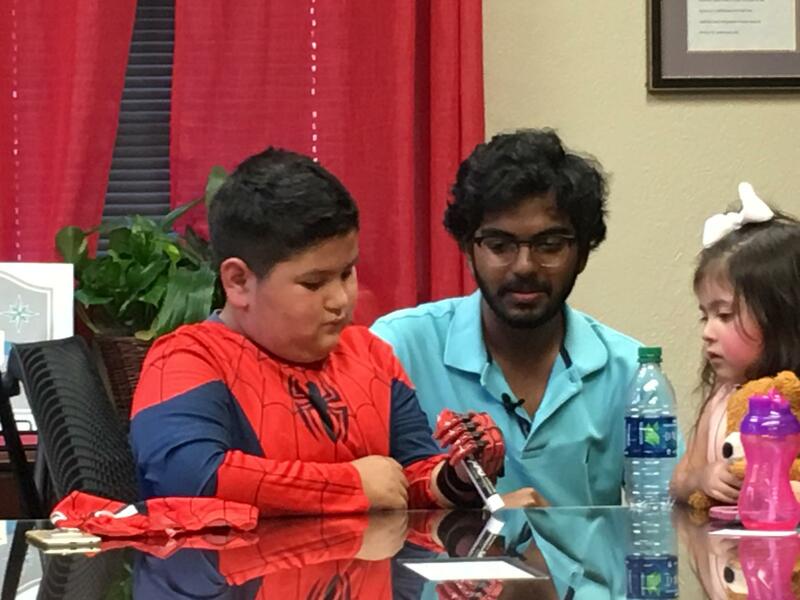 While Toby is still a little in shock, Lopez said, he has big plans for life with his new hand. 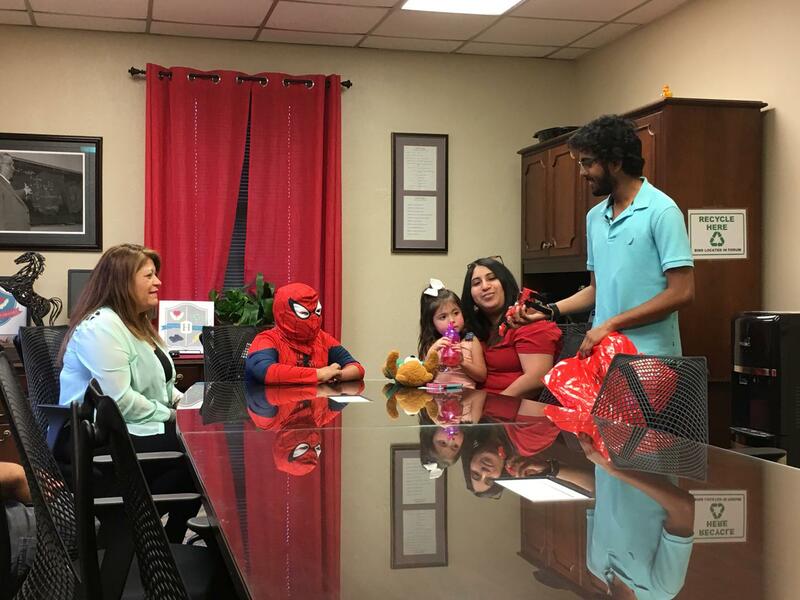 Although Toby never let life with only one hand slow him down – he already has been taking piano lessons for years – Lopez said she appreciates how many more possibilities he has now. And the fact that his new hand looks like Spider-Man is an added bonus. Scully said the hand's appearance plays a big role in that. Thanks to Pati and the Makerspace, Toby doesn't have to go without anymore. As he picked up a stress ball, turned to his grandmother and released it into her open hand, a grin began to spread across his face. “That was rough,” Scully admitted. “It was hard not to cry, especially once he was able to pick things up. He was able to figure out so fast exactly how that works. Right now, it's such an early stage of the prototype, I can't imagine what he'll be able to do as Teja moves forward. Watching his young friend, Pati said the results were well worth the effort he put in. “I was just elated; I was so happy he got the motion,” he said. “These things might take one to two weeks to get the full motion. When we grab something, we pull and our wrist pops back. His hand requires him to push forward. Because his other hand is fully developed, the motion opposes what comes naturally to him. But the fact that he was able to pick up a ball almost immediately was surprising. The project also was a first for Carrell, who enjoyed seeing Toby use his new hand.